Chapter 3: A Next Generation Legend! Stand Tall, Galactic Hero! Danganronpa: Trigger Happy Havoc (ダンガンロンパ 希望の学園と絶望の高校生, Dangan Ronpa: Kibō no Gakuen to Zetsubō no Kōkōsei?, lit. Dangan Ronpa: Academy of Hope and High School Students of Despair) is an adventure visual novel video game developed and published by Spike (later Spike Chunsoft) and the first game in the Danganronpa series. The game was originally released in Japan for the PlayStation Portable on November 25, 2010 and was later ported to iOS and Android devices on August 20, 2012. Two manga adaptations and two spin-off novels have been published, an anime television adaptation by Lerche aired between July and September 2013, and a stage adaptation ran from October to November 2014 in Tokyo's Nippon Seinenkan. A sequel, Danganronpa 2: Goodbye Despair, was released for PlayStation Portable on July 26, 2012. A compilation of both games, titled Danganronpa 1-2 Reload, was released for PlayStation Vita in Japan on October 10, 2013 and in Taiwan on January 16, 2014. NIS America released the Vita remake of the first game in North America on February 11, 2014, and in Europe and Australia on February 14, 2014. The game was also released on Steam on February 18, 2016 and for the PlayStation 4 in March 2017. 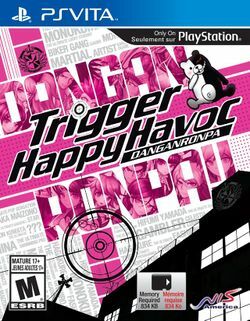 Danganronpa: Trigger Happy Havoc casts players in the role of Makoto Naegi, a student of Hope's Peak Academy, who finds himself trapped in a game of mutual killing among his students. Gameplay is similar in style to the Ace Attorney series, revolving around investigation and finding contradictions, albeit with an emphasis on faster gameplay. Each chapter of the game features two styles of gameplay; School Life, in which the player explores the academy and progresses through the story, and the Class Trials, where the player must deduce the culprit of a crime. Danganronpa takes place at an elite high school called Hope's Peak Academy (希望ヶ峰学園 Kibōgamine Gakuen), which accepts talented "Ultimate" students (超高校級 chō-kōkō-kyū, lit. Super High School Level) of the highest caliber in various fields each year. Makoto Naegi, a fairly optimistic but otherwise average student, is selected in a raffle and chosen to enroll into the academy as the "Ultimate Lucky Student". However, when Makoto arrives inside the Academy, he loses consciousness and wakes up locked inside the school, where he meets fourteen other newly picked Ultimate students who are in the same situation as him. A sadistic, remote-controlled bear named Monokuma appears before them, telling them they will be imprisoned in the academy for the rest of their lives, and that they will be put to death if they violate any of the school's rules. He offers only one way for students to "graduate" from the academy: murder another student and don't be identified as the culprit. This page was last edited on 20 February 2018, at 07:47. This page has been accessed 5,063 times.